Poster from the 1+million- person March for Women's Lives in Washington, DC on April 25, 2004. The major theme of the march was centered on women's reproductive freedom. 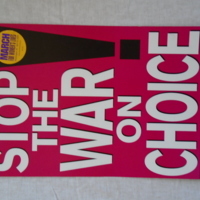 This poster boldly states, "STOP THE WAR ON CHOICE!" and was produced by Planned Parenthood. “March for Women's Lives Poster - 2004,” UIS History Harvest, accessed April 19, 2019, http://uishistharv1.uis.edu/items/show/211.